Ok, let's introduce you to some of the unique features of Mother Base itself. Mother Base is a physical location inhabited by various characters, and as such, there are various events and encounters that you can experience between your missions. Staff you've recruited into Diamond Dogs will salute you as you approach. Meeting your men face-to-face like this will raise their morale. So, it's a good idea to periodically return to base to maintain healthy morale among the staff. As you wander around Mother base you may also discover surprises from time to time. For example, raw diamonds which add to your GMP. Why are there raw diamonds scattered around Mother base? Did they fall out from one of the containers? We may never know for sure, but it'd be a shame to let them go to waste, so be sure to explore thoroughly. You can also eavesdrop on conversations at Mother Base from time to time. Some information will be useful...some not so much. When you start the game he's still a puppy, but eventually he'll grow into an adult and become a valuable buddy that you can bring into the battlefield. Mother Base also features portable showers on deck so you can quickly shower off between missions. This helps to wash away the blood and fatigue, so that you can jump back into the field refreshed and ready for action. Forego a shower for too long, and it will actually have adverse affects on your performance and the way that other characters interact with you. So, be sure to head here every once in a while to wash away the stress along with the smell. There are showers conveniently located near the primary heliport on each platform of Mother Base. Flies buzzing around your head is never a good sign and if you neglect your hygiene for too long....well, you can expect your staff to kindly give you a hint and in certain cases, maybe even lend you a hand! Aside from collectible value, posters do actually have an in-game use. Their actual purpose has been kept secret for the time being but I'll have a full guide on posters and their purpose in the game soon. One other thing we've forgotten to mention is the ability to train on Mother Base. Target practice trials such as this are a handy way to familiarize yourself with new weapons, while exploring various parts of Mother Base and earning rewards in the process. Each area of Mother Base has it's own unique target trials, so discovering all of them is half the fun. Finally, never forget that you are responsible for Diamond Dogs and that all of your actions or lack of action will affect the organization. In The Phantom Pain, drama unfolds not just during your missions, but also between your missions back at Mother Base. Keep this in mind and make a conscious effort to monitor your army. 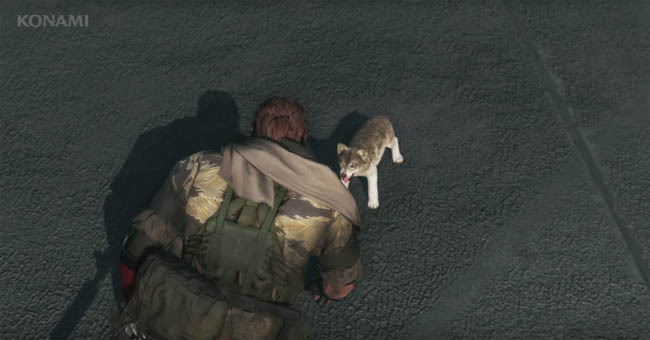 Miller and Ocelot will do their best while you're out, but Diamond Dogs consists of soldiers from all backgrounds, and occasional conflicts may occur. It's up to you as the leader of Diamond Dogs to restore order and keep things running smoothly. Be sure to head back to base often and be a proper leader to your men. Also keep in mind that how you grow Mother Base is up to you. When you're ready to expand your reach even further, invest in Forward Operating Bases. Just keep in mind that FOBs will expose you to interaction with other players. Some of them will be allies, others will be enemies. But for those who truly want stand out on the world stage, it's worth taking that risk. You can add personal touches such as custom emblems or color schemes, and expand in the way that best supports your play style. As your army grows, you will eventually be able to expand beyond Mother Base and establish Forward Operating Bases, or FOBs, allowing you to support more men and refine more resources. 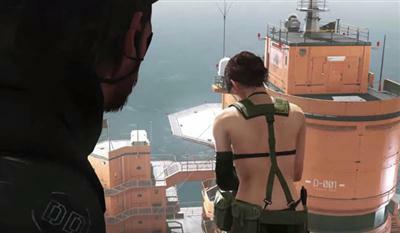 In gameplay terms, they function as an optional online version of Mother Base with all of the same customization features. As your presence online, FOBs allow you to stake your claim on the world stage. Every player's FOB is unique and their development will compliment Mother Base by funneling increased profit, resources, and manpower to Diamond Dogs. In addition, FOBs in certain geographic locations can also be used to autonomously mine resources, further accelerating development. However, building an FOB does come with certain risks. 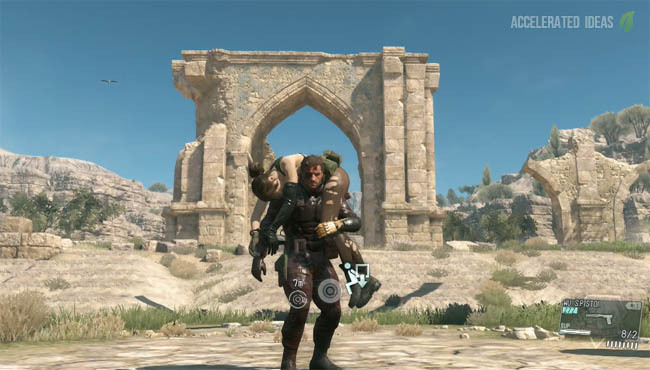 Since FOBs are built in remote online locations away from Mother Base, they are susceptible to attack by rival players. Other private forces, players online, may target and attempt to steal resources or manpower from your FOB. To minimize this threat, you'll need to implement security measures and respond quickly to intrusions. To begin with, artillery that you Fulton during your missions can be sent back and installed as defenses on your FOBs. Note that you can remotely issue orders to Mother Base while in the field by using your iDroid., without heading back to base. You can manage security settings and develop security devices such as UAV drones to defend your base. Once development is complete, you can assign drones to patrol platforms on your FOB and engage enemies. 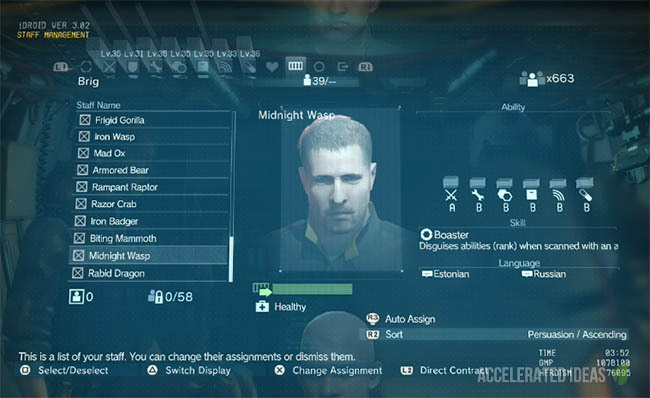 At Mother Base you can manage security settings for each platform. You can choose to manage basic security presets or customize all of the detailed settings. In either case, security isn't free, so aim to balance defense level and cost based on your GMP. Red icons indicate the activities of the intruder. You can analyze their route and plan your defenses accordingly. However, in the event of an active intrusion, you may also return to base and handle things personally. FOB invasions can happen at any time, even during missions. Do note that while FOB does feature PVP gameplay, it is different from MGO. Whereas MGO pits groups of soldiers against each other, the action in FOB is one-on-one, with the primary focus being on the massively multiplayer metagame experience of pitting your army against rivals from around the world.